So Fresh And So Pressed, Pressed. half wit. half wisdom. a whole lot of nonsense. Each week, I’ll be listing off my favorites from all the wonderful blogs I follow. I mean, if I love you, why shouldn’t the rest of the world? So, without further adieu, here are the posts that really got my attention this week! Taylor of P&L (just created that little abbreev right there, sorry Taylor!) writes a great post about dealing with your boyfriends’ bromancing ways, and how to keep a great balance between relationships and friendships. This post wonderfully explores the idea of virginity, and how ‘losing it’ doesn’t always have to be significant. Routine Dreamer: How Technology Ruins Social Interaction. Loved this post on technology and how it has seriously influenced how people, for lack of a better word, communicate with each other in today’s social world. Great read that really makes you think about how addicted you are to your phone, and how easy it is to hide behind a computer screen! Nicole writes an extremely relatable post for anyone who has worked in the service industry on dealing with customers who value their time above, well, everyone elses. I didn’t think people needed to know why girls love Instagram. But they do. They really do. And Jamie does a great job at explaining it to the people who just don’t get it. Well, didn’t think I was going to do this little post without doing a little shameless self-promotion? Oh, you did? Well, sorry I’m not sorry. Read this little post I wrote as my alcoholic nerd alter-ego over at Tipsy Lit. Do you have a favorite post from this week? Submit it in a comment and maybe I’ll feature it next Friday! 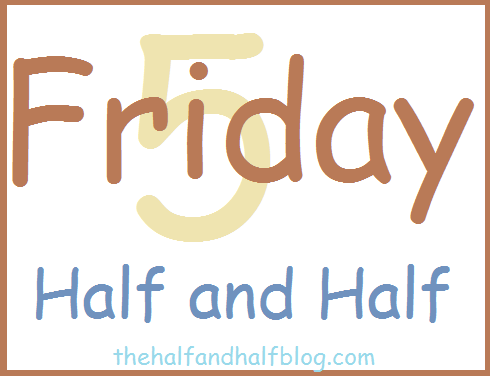 Posted on June 20, 2014 June 20, 2014 by Half and Half	This entry was posted in Random and tagged blogging, favorites, friday five, now following, random, real talk, round ups. Bookmark the permalink. This is such a sweet, and really cool, idea. Since I’m a newer kid on the block, I love discovering the kickass blog writers out there. Thanks! Thanks, me too! Hopefully you find some good ones! Great idea. Will get some great stuff out there. definitely! looking forward to reading your stuff! Thank you so much for including me, Meg! I’m honored! Thank you so much for featuring me here! Glad you enjoyed the post. 🙂 I’ll be checking out the others! Thanks for sharing!